Is Your Indexed Annuity a Stock, a Bond, or Something Else? Good question, ya’ think? Maybe we should begin with what a fixed annuity is; then move to an indexed annuity. When you loan your money to a bank, they give you a CD that pays a fixed rate until the CD matures and then return your money, paying off the loan. When you loan your money to a government or corporate entity, they give you a bond that pays a fixed rate until maturity and then they return your money, paying off the loan. Both of the above scenarios are basically bond scenarios: A bank bond, a government bond, a corporate bond. All three are I.O.U.s. When you loan your money to an insurance company, you get an I.O.U. from them, too. They pay a fixed rate – sometimes even a bonus on top the first year – with one extra benefit: As long as the interest accumulates inside the annuity, it’s tax-deferred. The benefit of tax-deferral, of course, comes with a price: You might have tax issues if you ‘cash-in’ before age 59-1/2. That’s an I.R.S. requirement, not the insurance company’s – but, I digress. 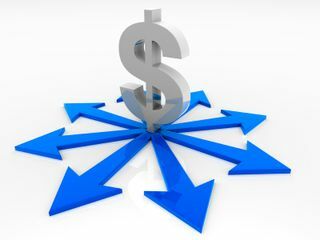 At its core, a fixed annuity is essentially a loan to an insurance company in exchange for a tax-deferred fixed rate of interest, paid by the company – it’s an insurance company I.O.U. Annuitizing, a separate discussion, is an option, not generally required. This is a fixed annuity, too. It pays a fixed rate of interest for a term chosen by the annuity holder. What’s the fixed rate? It depends on what it’s “pegged” to. Most people seem to like the S&P 500 Index. They don’t’ own the index – which is impossible, anyway – they simply receive a rate of interest determined by the performance of the index. What is the term? It depends on the crediting option chosen. Annual point-to-point (comparing only two index values – beginning date and anniversary date – has a one year term. Others could be monthly, etc. Companies are also beginning to use a volatility control index, as well. The point: It’s still a fixed annuity with the insurance company resetting the interest rate according to the performance of an outside index. Is this a stock? No. There’s no equity ownership in any company, either directly or indirectly. Is this a bond? Well, yes BUT. It is a bond in the sense it’s an insurance company I.O.U. The fact that the interest rate will move up or down based on the performance of some outside index is immaterial. The BUT is this – and it’s a good one: These can be used to supplement the bond portion of a portfolio but will often outperform bonds. The reason is simple: The rate credited, tied to an outside index, can rise with that index (often up to a ‘cap’). When they do, those gains are ‘locked-in’ on the anniversary date. They never go back down! You never lose money. Those gains are also tax-deferred, which is better than paying taxes on CD money you’re not touching or bond interest you’re not using. Are FIAs right for everyone? No. Nothing is. They certainly shouldn’t be purchased al-a-carte; they’re complex products and should be installed into a portfolio as part of an integrated financial plan. While FIAs carry no annual fees, unless you attach riders, they do carry surrender charges if funds are accessed in greater amounts than the contract provides. Even though many contracts allow 10% free liquidity provisions, it’s still worth noting. This may not be an issue for those who do not need to touch the money; but, it’s another reason they should be part of an integrated financial plan that has planned for liquidity contingencies. Someone who’s looking for guaranteed income as the main focus – not focused on liquidity or needing to walk away with a giant lump-sum at a future date – FIAs can be an excellent portfolio supplement. The combination of (1) no downside risk, (2) tax-deferral, and (3) returns that will probably outpace bonds (due to equity upside participation with no downside risk), make FIAs pretty attractive. For those under age 55, there are other insured options that might be considered before settling on an FIA. Many experts believe that taxes will rise and it might make more sense to reposition assets early to arrange a tax-free retirement. IRA guru Ed Slott, a CPA, and David M. Walker, former U.S. Comptroller General, are big proponents of this. If you’d like a free report on this, you can get it here. Why the surrender charge and how does the insurance company make equity-related payouts? Insurance companies may be the best risk managers on the planet, which may explain why so many of them went through the Great Depression never missing a claim payment while Wall Street was watching people jump out of windows. Their process for meeting index-related obligations is pretty simple, really (though not simplistic). The vast majority of premiums are generally invested in long-term bonds. But, with rates so low, how do they earn enough money to make higher payouts when an index goes up? Just for the sake of illustration, I’ll use simple numbers. An insurance company might invest, for example, 95% of its FIA premiums in long-term bonds, in order to get a decent bond market return. The other 5% would go to buy call options on the index – a ‘call’ is the right to purchase at a specified price if the market rises. If the index goes up the company executes the option to purchase. If not, the company lets the option expire. Naturally, some options are paid-for and never executed. As for the surrender charges, there’s not only the cost of unexecuted options – a relatively small piece of the puzzle – but, there’s also the long-term bonds that must be sold in order to meet a redemption request. The company not only may face a loss on those bonds – maybe not, it depends on interest rates and price movements – but must also forgo the interest they would have received on those bonds as part of their total portfolio in order to meet all outstanding obligations to policyholders. The surrender charges also serve to help reimburse the company for the marketing costs they had originally paid out of their general account. Because FIAs can be sold by insurance agents who have no securities license – it’s not a securities sale – they can easily be either misrepresented or, more often, even misunderstood by the agent making the sale. One area has to do with a working knowledge of the underlying indices from which a client must select. The biggest issue, however, may be the solvency of the issuer. As I said, FIAs are really insurance company I.O.U.s. The risk of performance may be on the insurance company, but the risk of an insolvent carrier may be another issue. It’s worth noting that most of the ratings from agencies cited in their ads are actually paid for by the carriers being rated. 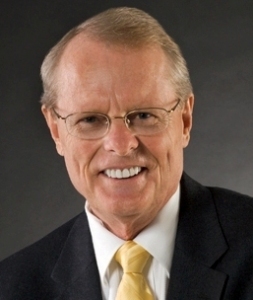 Ideally, the person recommending the annuity issuer would be someone who can get “under the hood” of the insurance company financials and not rely on paid-for company ratings. This would call for, at a minimum, someone who’s securities licensed or preferably a Registered Investment Advisor with additional recognized credentials. There was a time when companies in America provided pensions to their retired workers. These defined-benefit plans have all but disappeared, which is why income-replacement has become a huge issue as boomers face retirement. The argument in favor of income replacement tools is simple: You insure your house, your car, your health, and some even their dental visits; why wouldn’t you insure your future income. Many people who pride themselves in paying cash for everything else still find it difficult to pay cash for an income they can’t outlive; but, as I said earlier, it must be done carefully and as part of an overall plan because income isn’t the only factor in everyone’s lives. This excellent question was posed by Ben Mattlin in the June issue of Financial Advisor Magazine. Do You Know the 5 Biggest Risks To Your Retirement? Do you know what your biggest retirement risks are? Many might think, after watching all the coverage about Greece, computer glitches on Wall Street, and stories about hackers, that it might be the financial markets; but, the fact is there have been all kinds of melt-downs over the years and some people’s plans were unaffected! Those people, of course, tended to be the ones that had plans that anticipated the 5 Biggest Risks! To Roth or Not to Roth – Should You Do a Conversion? Steven Elwell, a CFP® practitioner in Amherst, NY recently wrote a nice piece for NerdWallet on this subject. You want to reduce the value of your estate for income tax purposes. If you’d like to read Steve’s article, you can access it here. The points worth noting in particular – my own opinion – are #1 and #4. Tax brackets are historically low. There was once a time when the highest marginal bracket was 90% before the early 60’s, when President Kennedy began to initiate cuts. As you can see from the chart below, the general trend has been down for some time, although it’s also worth noting a lot of deductions have disappeared along the way. 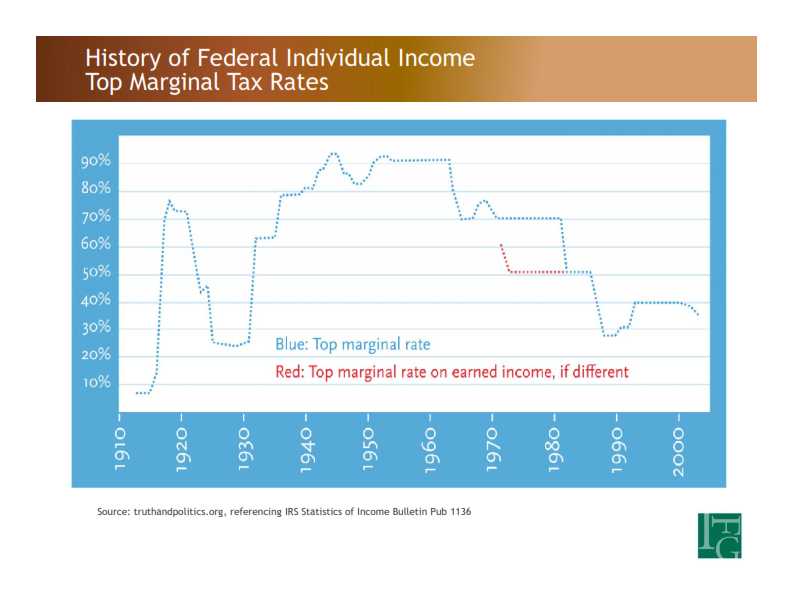 While top marginal tax rates have declined, it’s also true that the Government is still spending your money – usually favoring whatever groups will help them get re-elected – I know, I’m a cynic. Nevertheless, as I take great pains to avoid any mention of Greece, the government keeps spending. While those in office take pains to point out the annual deficits have been in decline, the fact is those deficits still add to the existing debt. There is a difference between the reported national debt and the REAL debt. The reported national debt is now over $18 trillion; but the real debt is very different. The government engages in different accounting than the rest of us. If you purchase a car with nothing down, for example, you would have to list the entire outstanding balance as debt on your balance sheet. Not so with the government; only the current year’s payments are counted as debt. 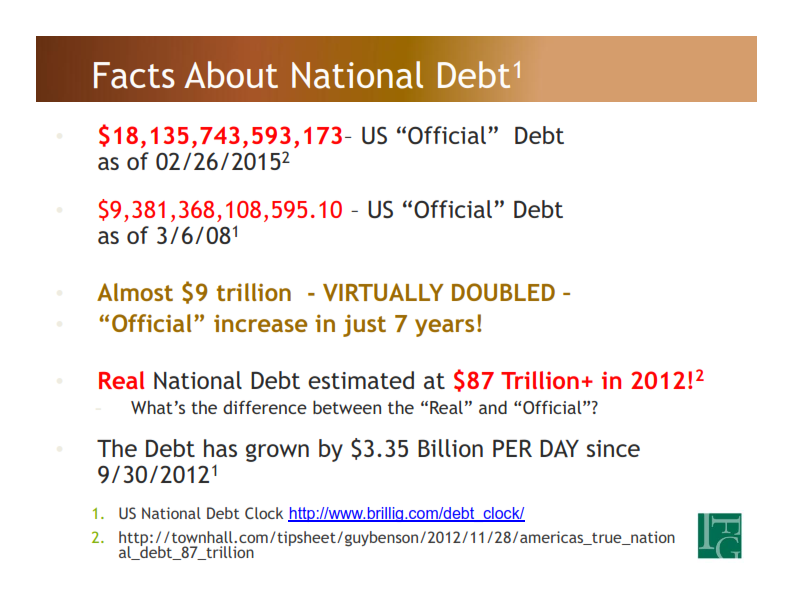 Result: While the government reports $18 trillion, Townhall.com estimated the debt at $87 trillion – and that was in 2012! 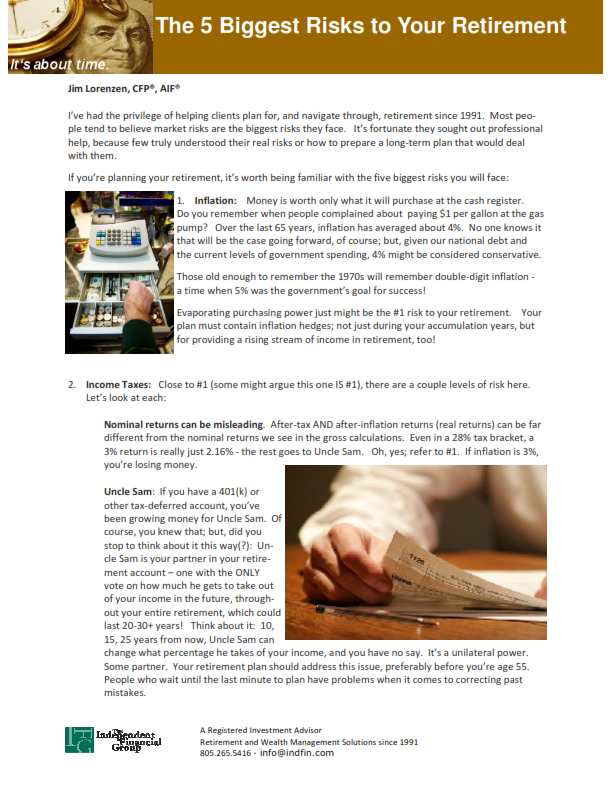 Not long ago I did a webinar entitled How To Plan for an Income Tax-Free Retirement. A number of those who attended, and a few who couldn’t make it, have asked me if I had a written report they could download. I’ve created an updated version outliining this strategy, which is really most worthwhile for those who are successful and most likely between ages 35-55. Those between 55 and 60 may still benefit. You can learn more here. One of my hobbies, if you can call it that, is American history – particularly the period between 1765 and 1800. It was during that 35-year period that the colonies declared their independence, and began a rebellion that morphed into a full-fledged revolution (which had NO chance of success) that defeated the largest and best-equipped fighting force on earth. During the summer of 1787, the best minds the colonies could produce met in Philadelphia to hammer-out a framework of government. While Adams and Madison had performed extensive research on the history of republics, they had to make adjustments because few lasted very long and all had failed. The resulting constitution provided the framework of government that became a reality in 1789 when George Washington took office as the first President of the United States. The new government was funded by a financial genius Secretary of the Treasury, Alexander Hamilton. The funding came from a bank he founded: The Bank of New York (now BNY Mellon, which owns Pershing). The Constitution they created that summer, that we still have today, is – are you ready? – the oldest functioning constitution in the world today. No country anywhere on our planet is operating under a constitution older than ours…. Not Greece, not France, not Italy, no one. It says something about the minds that met in Philadelphia that summer. Each of them brought something unique and brilliant to the table. Few people realize that the banking system, credit and stock markets, our system of trade, including the customs service, were all designed by Alexander Hamilton. He’s one founding father that could walk into our financial system today and recognize all of it, maybe except the machines, because he created it all. James Madison, the father of the Constitution, would probably be amazed to see that the constitution still lives, albeit with expected amendments since that process was provided for in the original document. All other constitutions in existence around the world at that time are no longer around. Enjoy the holiday! This one is one of the great birthdays we celebrate.